What is a sportboat? Is it similar to a sports car where performance takes priority over comfort? Most sportboats sacrifice a bit of comfort belowdecks in favor of comfort in the cockpit. The Catalina 275 Sport is billed as the company's first sportboat, but that doesn't mean it won't be great for cruising or daysailing. You can cruise the 275, but the emphasis is on sailing performance and a cockpit designed to optimize sail-handling functions. Maybe sportboats are souped-up daysailers, if you allow that the daysailers of today also have minimal accommodations. It's hard to really pin a label on this new Catalina. Throw your sleeping bag on board and some food and you'd have a nice pocket cruiser. The 275 is not an ultralight boat, but it is a light boat with a displacement of 4,200 pounds and a D/L of 122. The L/B is 3.27 and beam is 8 feet 4 inches. The hull is fine forward but I see no hollows in the entry. The stern is broad with a hard turn to the bilge. There are options for either a deep-draft lead fin drawing 4 feet 5 inches or a winged shoal fin drawing 3 feet 5 inches. It's a nice looking hull. I probably would have gone with a tiny bit more spring to the sheer but that's just me. All in all, it's a well-proportioned boat. You can blast around the bay all day comfortably in the big cockpit with extra-long seats and generous backrests, but if the mood strikes you can spend the night aboard. To starboard there is a quarterberth that can also double as a small kayak stowage spot. There is an enclosed head to port with plenty of seated leg room. To starboard is a small galley with a one-burner stove and a sink. Forward of this is the V-berth and settee area with a table for dining. There is a space for an optional saildrive 14-horsepower Yanmar diesel auxiliary just aft of the companionway. I can't see where you would keep your icebox or cooler, but you could keep it in the big sail locker to port and aft. I like the spacious feeling you'll get when sitting forward at the table. The rig is a simple fractional sloop rig with the convenience of a self-tacking jib. The SA/D of 21 is on the low side for a sportboat, but I would not call it anemic at all. There is plenty of power in this rig but it should not be intimidating. There is an option for a retractable bowsprit and an option for a split backstay adjuster. The mainsheet traveler is on the cockpit sole. With the jib being self-tacking you don't need two jibsheet winches. The standard layout has one winch on the cabintop but there is an option for a second cabintop winch. 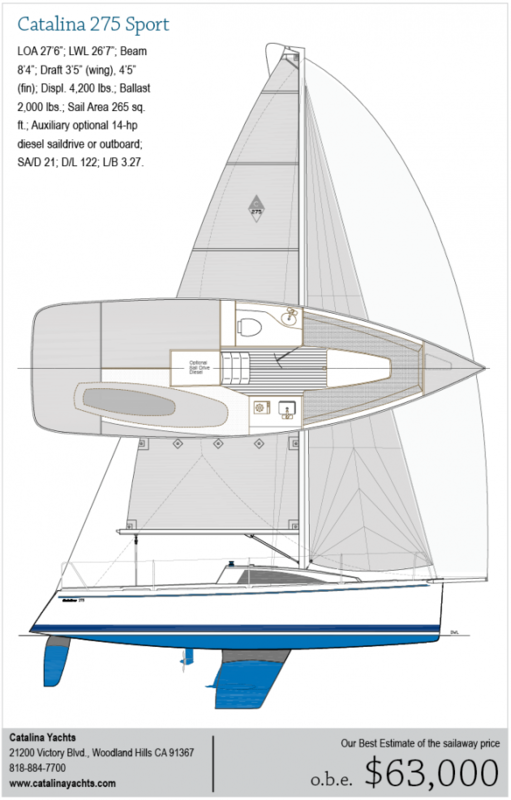 Another option offered is cabintop genoa tracks, if you want to add power with an overlapping headsail. I like this cockpit design. The long seats are sunk into the boat so that you have good backrest height without it protruding above the deck. But the helmsman position is raised and essentially on the side deck where the helmsman can sit outboard for better visibility. There is an anchor locker in the bow to port. This is a sharp looking little boat. I would be surprised if we don't see fleets growing for some good one-design racing.